Mrs. Mildred “Millie” Rita (Jacques) Viering of 297 Victoria Road, Hartford, was born April 3, 1917 in Northampton, Massachusetts, daughter of Canadian born Marion (Rodrigue) and Massachusetts native Oliver L. Jacques. 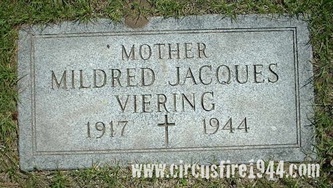 Mildred and her son Paul, 4, were found dead at the circus grounds after the fire on July 6 and were buried at Mt. St. Benedict Cemetery in Bloomfield after services at the O’Brien Funeral Home in Hartford on July 10. Mrs. Viering leaves her husband, Joseph A. Viering, 33, with the Hartford Fire Department; her parents, of Hartford; two brothers, Herbert E. Jacques, 22, Seaman First Class with the U.S. Navy and Wallace Jacques, 18, of Hartford; three sisters: Mrs. Beatrice Lewis, 43, of Elmwood; Miss Dorothy Jacques, 34, of Hartford; and Mrs. Gladys Benetti, 31, of Wethersfield; and her grandparents, Mr. and Mrs. John Rodrigue of Northampton. Body #1584 was identified at the State Armory as Mildred Viering by her husband, Joseph, on July 7. 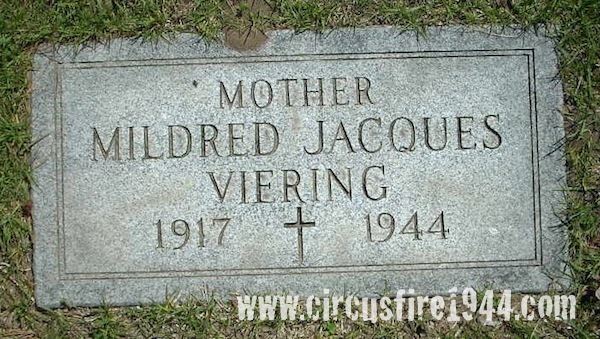 Mildred and her son Paul attended the circus with her sister-in-law Theresa (Viering) Franz, 35, and her husband Richard Franz, Sr., 41, and their son Richard, Jr., 6. Theresa and Richard Jr. sat with Mildred and Paul in the reserved seating area until an usher made them move to their own seats in the bleacher section. Moments later, the fire began behind the area where Mildred and Paul were seated. The Franz’s escaped without serious injury.